In the United States, sudden cardiac arrest claims more than 350,000 lives each year. As a leading cause of death in the world it is frequently caused by ventricular fibrillation, an abnormal, chaotic heart rhythm that prevents the heart from pumping blood. The most effective treatment for ventricular fibrillation is delivering an electrical shock to the heart with a machine called a defibrillator. 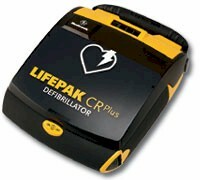 Recent advances in defibrillator design now make it possible for rescuers with limited training to provide defibrillation earlier following sudden cardiac arrest using an Automated External Defibrillator (AED). Following this program your employees will be able to integrate the AED into the “Chain of Survival” thus increasing the chance of survival for someone experiencing sudden cardiac arrest.